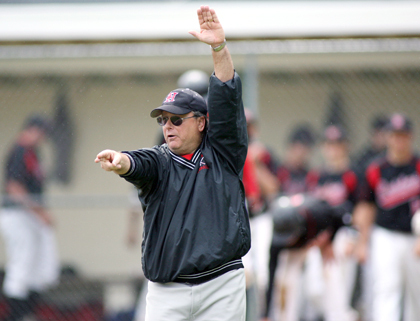 SHOWING THE WAY: Hun School baseball head coach Bill McQuade directs traffic last weekend during the state Prep A tournament. Hun went on to edge Lawrenceville 7-6 on Sunday to earn the title, its first Prep A crown since 2002. The win gave Hun a final record of 20-4 as the team set a program record for wins in a season. McQuade, the head of Hun's Upper School who is in his 37th season coaching the team, got an impromptu shower after Sunday's win as his players doused him with the water bucket. For more details on the game, see page 40. A proposed Princeton University arts neighborhood that is expected to usher in major changes in the area surrounding the McCarter Theatre Center will produce a greater ease in traffic, while moving New Jersey Transit's Princeton "Dinky" station nearly 500 feet further from Nassau Street, according to revised plans released by the school this week. After the defeat of the Princeton Regional Schools' 2007-08 budget on April 17, officials from Princeton Borough and Princeton Township, working with the Board of Education, agreed to cut $1,050,000 from the tax levy for Princeton homeowners. Town Topics celebrated a milestone in its 61-year history when it moved from the University-owned building it had occupied at 4 Mercer Street for 57 of its 61 years and took up new quarters in a renovated building at 305 Witherspoon Street. Potts Playground is one of those successful pocket parks in the Borough, providing quiet solitude for residents of the surrounding neighborhood, some play equipment for area kids, while offering an in-town location where residents can hold community events. Following a tumultuous week of reexamining the Princeton Regional Schools 2007-2008 budget, Princeton Township Committee treated its own $33.175 million operating budget like a walk in the park. It passed, 5-0. The Princeton Environmental Commission, following up on a discussion earlier this year on preserving environmentally sensitive lands along the Princeton Ridge, was more or less rebuffed on a technicality Monday as the agency urged the governing body to reconsider zoning in a senior-housing designated zone on Bunn Drive. A year ago, the Princeton University women's open crew roared into the NCAA championships as a clear favorite to win the grand final. The NJSIAA Tournament of Champions state golf tournament is a pressure cooker than can wilt the nerves of even the most confident of players. Shane Davis was determined to end his Hun School athletic career on a high note last weekend as the Raider baseball team competed in the state Prep A tournament. The view from the new Town Topics building on Witherspoon Street includes the backyard of the Italian-born tailor Frank Porcaro, who has created a little bit of Italy right here in Princeton. Since he is well acquainted with the neighborhood, it was only natural that we stopped by for lunch at his home on Carnahan Place. A roof over your head, a house to call your own  basic for so many, out-of-reach for so many others. It has been Marcy Crimmins' goal to help people find a way to achieve this most essential need.